Yesterday we went to the going away party for one of our pastors and his wife, from our church Terra Nova Church. This pastor and his wife did our premarital counseling with us, and have been an integral part of the church since well before either of us started attending. They are moving to a church in Florida and will be a great blessing and addition there, but will surely be missed here. Yesterday I also made chicken parm for dinner. 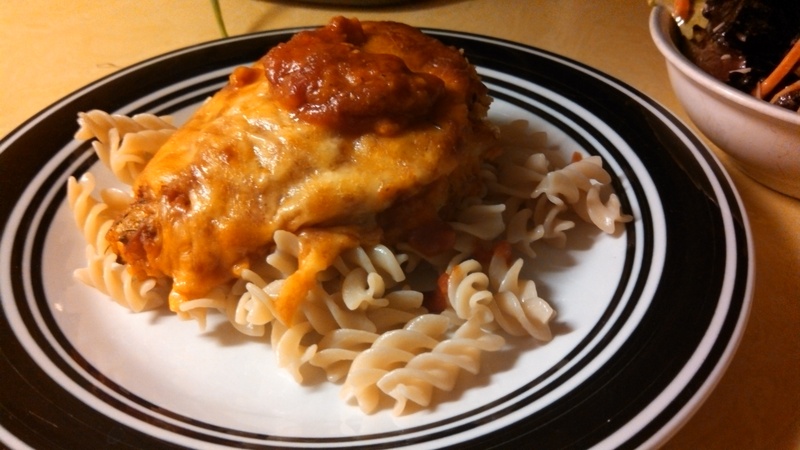 The recipe was entitled “lightened-up chicken parmesan” but there wasn’t really anything light about it. 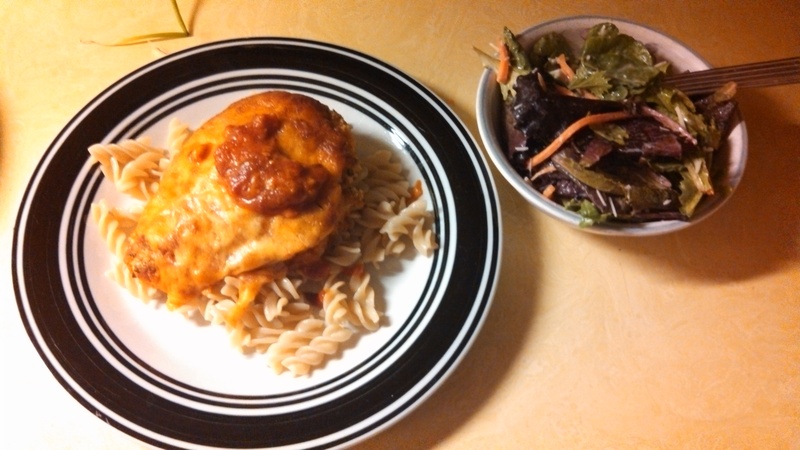 I’ve made chicken parm once before, which was a much healthier version, but last night’s was, well, amazing. And amazing things tend to be slightly less healthy. I realized that last time, I cut one large chicken breast in half, and since these ones were so large also, I could have easily done that again. You might think my husband is lucky to have a wife that cooks homemade chicken parmesan…but really, I’m the lucky one, cuz I get to EAT homemade chicken parmesan. Also, last night we watched I am Legend, because my husband loves that movie and wanted me to see it…but I realized about 1/4 into it, that I’d seen it before. Oh well. -Set up 3 bowls: first, add the flour, second, add the beaten eggs, third, add the bread crumbs, italian seasoning, and parmesan cheese. -Preheat skillet to medium heat. Add olive oil. 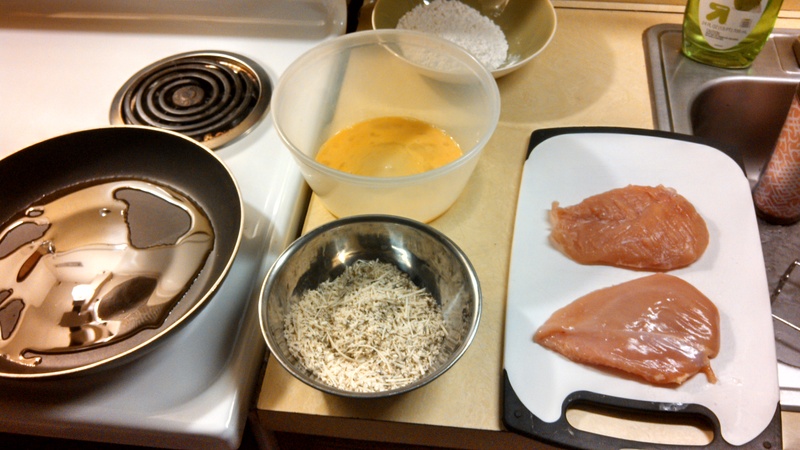 -Dip each chicken breast in flour, egg, then bread crumb mixture. Lay in pan and fry until golden brown (but not fully cooked!). -In a baking dish, add 1/2 cup of tomato sauce on the bottom. 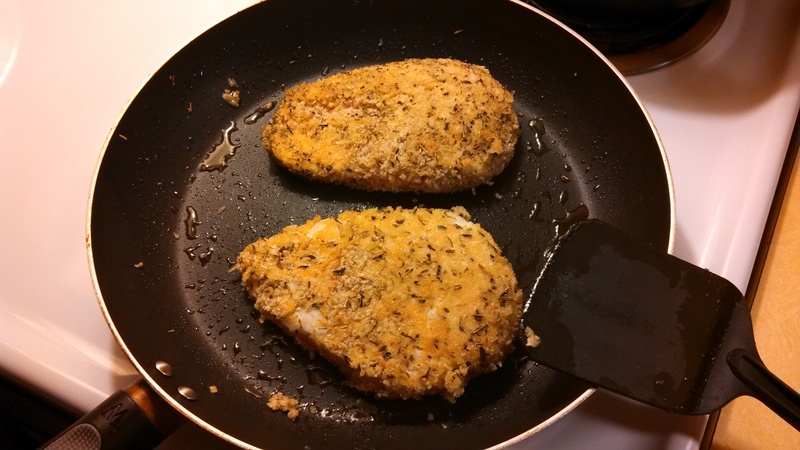 Lay chicken breasts on top. Add remaining tomato sauce, and prov/mozz mix. -Bake for 20 minutes. Tent with foil (be careful, the baking dish will obviously be hot), and bake for another 25 minutes. -Serve with pasta (and salad – mine included baby spring greens, shredded carrot, sprinkle of parmesan cheese, and light dressing).